In an NBA offseason filled with landscape changing movements, there have been few teams that stood pat and said, “We like what we have” and leaned on it. Chief among those teams is the Utah Jazz, who advanced to the Western Conference semifinals before falling to the Houston Rockets in five games last season. Crashing out of the semifinals in five games illustrates how much work the Jazz need to do before truly contending with the upper echelon of elite NBA teams. While some front offices would swing for the fences to grab marquee names to bolster their roster, the Jazz elected to bank on internal development and their coaching staff’s machinations to get better. This offseason, the Jazz re-signed Derrick Favors, Dante Exum, and Raul Neto, waived forward Jonas Jerebko, guaranteed the contracts of Ekpe Udoh and Thabo Sefolosha, signed their G-League project Georges Niang to a multi-year contract, and drafted Grayson Allen. Simply put, Utah is going into the new season with virtually the same team they ended with against Houston. Under the watchful eye of head coach Quin Snyder and general manager Dennis Lindsey, the Jazz have become a model of consistent improvement. Ever since Snyder took over in 2014, Utah finished the season better each year and developed elite talent during that stretch. Proof of their penchant for player development can be seen in Rudy Gobert, who spent his early days in the league cutting his teeth in the then-D-League, and the growth of former Jazzman Gordon Hayward. Gobert spent part of his rookie season assigned to the Bakersfield Jam. The 27th pick of the 2013 draft dramatically improved each year, eventually resulting in a spot in the 2017 All-NBA 2nd Team and a 2018 nod for Defensive Player of the Year. With Hayward, the Jazz developed the former Butler Bulldog into an All-Star in a loaded Western Conference through a seven-year period. In 2017, Hayward became the Jazz’ first All-Star since Deron Williams in 2011 and became one of the most coveted free agents of that year’s offseason. Hayward left the Jazz for Boston that same year, but Utah found a new star soon after in the 2017 draft. Showing a keen eye for talent identification, Lindsey orchestrated a draft day trade for Donovan Mitchell with the Denver Nuggets. A famous anecdote from Mitchell’s pre-draft workout with the Jazz is that Lindsey threatened to fire any staff member who leaked any details of the Louisville product’s performance. “One of the guys [Lindsey] works with came over, and literally was like, ‘Dennis wants to make it clear, if any word about this workout gets out, you’re fired. Everyone. You’re fired,'” Utah Jazz radio broadcaster David Locke told the Washington Post’s Tim Bontemps. The general consensus back then was that the Jazz would replace Hayward’s All-Star production by committee, relying on Rodney Hood and a slew of free agent signings to carry the scoring load. Utah also added former Timberwolves point guard Ricky Rubio via trade to replace veteran George Hill. It looked like a season that would be tough to watch on the offensive end, but no one expected what Mitchell would have in store for them. Mitchell was a revelation for the Jazz, electrifying the league with his high-leaping ability and high-volume scoring. 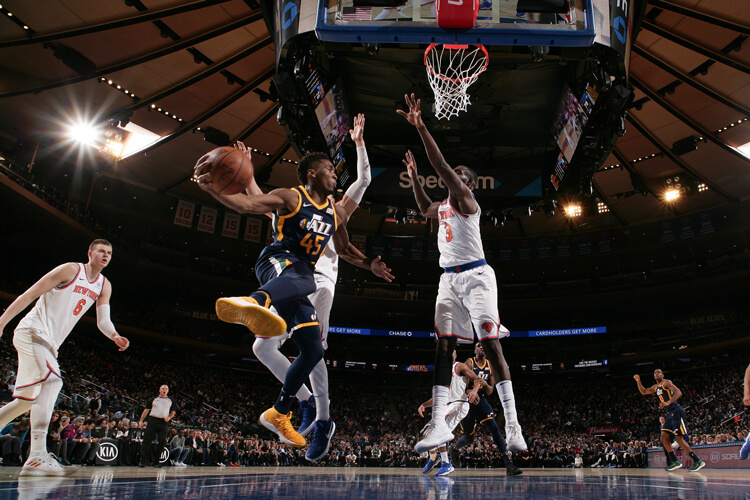 It is a challenge for most players to have 20-point games in the regular season, but Mitchell found a way to have multiple 20-point quarters in the playoffs. The prized rookie finished with per-game numbers of 20.5 points, 3.7 assists, and 3.7 rebounds in his maiden season. Utah found something special in Mitchell, but as good as he was in his maiden season, there is still so much room for him to grow. Had the Jazz gotten another star piece this offseason, that may have been enough for them to reach that upper echelon of actual championship contenders. But the lack of any significant roster moves is a sign that the Utah front office believes that their best path to a chip is growing from within. Gobert, Mitchell, and Hayward are all prime examples that the Jazz front office and developmental staff can find and create stars from what they have. They also proved that they can improve players in the short term as shown in their work with Rubio by turning him into a fairly respectable three-point shooter, and reviving Jae Crowder’s season, who looked terrible as a Cleveland Cavalier. The Jazz were an elite defensive team in league, with a 101.6 defensive rating in the regular season. That was despite not having reigning Defensive Player of the Year Gobert due to injury for long stretches of the year. That rating is good for second in the league, trailing the Boston Celtics by only 0.1. In the upcoming season, the Jazz look to dominate defensively yet again. With little roster turnover, they can be good on defense from the opening tip of the season because they wouldn’t have to deal with teaching a host of new faces their defensive schemes. But how about offense? Utah had trouble finding the bottom of the net against Houston in their semifinal series loss, how do they solve that? Coach Snyder crafted one of the league’s most egalitarian offenses to hide the roster’s lack of dominant offensive talent. Mitchell gave the Jazz offense an edge they sorely needed and he should be better in his sophomore year, but one man could only do so much. Since the Jazz couldn’t attract more star power that could drastically improve the team offensively, it will be up to Snyder and his staff to add more wrinkles to their already complex system and baffle their opponents. Last season, Utah was very middle-of-the pack with an offensive rating of 106.2 in the regular season, good for the 15th in the league. An improved offense paired with their team’s stifling defense could significantly bolster the team’s championship aspirations. With that in mind, Snyder and his staff need to start tinkering. Snyder isn’t just someone who looks like a mad scientist in a suit, he is a man that has earned the respect of the league as evidenced in his nomination to the Coach of the Year race. Snyder also reportedly has the backing of a certain Kobe Bryant as one of the league’s best basketball minds today. Reports from the Jazz training camp says that they are working on adding ways to attack the type of defense that basically ushered them out of the playoffs two seasons in a row. 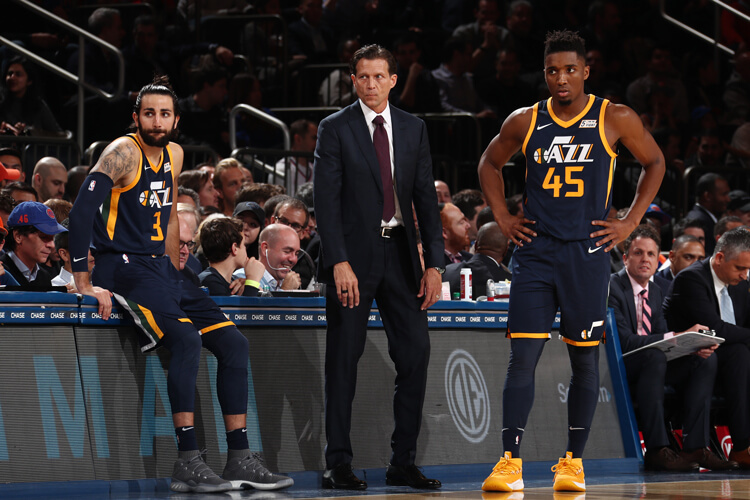 If Snyder is successful at creating a system that could break the in-vogue switching defenses of Golden State and Houston, then maybe the Jazz can look beyond a third straight trip to the Western Conference semifinals. Right now the Utah Jazz is like a spinning top, it looks like it isn’t in motion due to the lack of any notable roster transactions but they are actually moving at an incredible pace and could run over teams who aren’t ready for them. 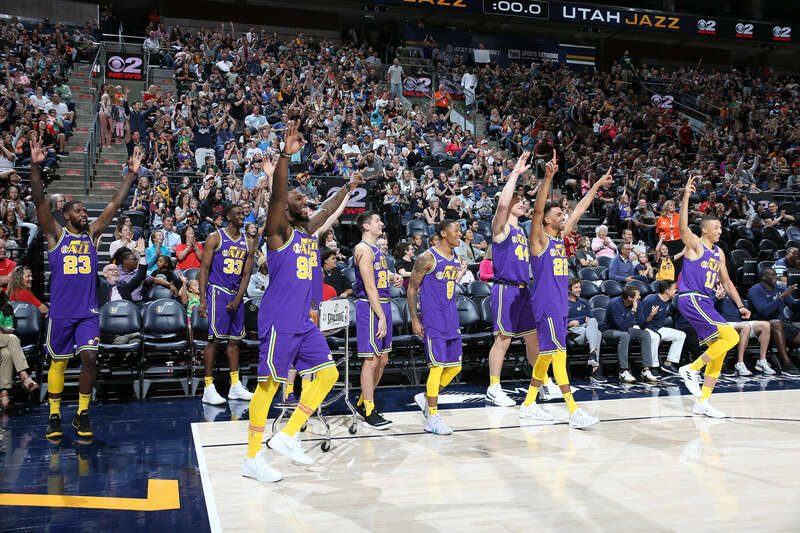 The Jazz head coach preaches that “the strength of the team is the team” and his players have echoed that statement in many interviews throughout last season. This year, we will see how much a year together under their belt aids their bid towards championship contention. With an ever improving cast and the machination of Snyder and his staff, the Jazz front office’s bet on growing from within seems like a smart choice. On the outside, it seems like the Utah Jazz aren’t moving and are resting on their laurels. But a deeper look at the Jazz will show you that the complete opposite and are speeding down the road to a championship faster than most would expect.